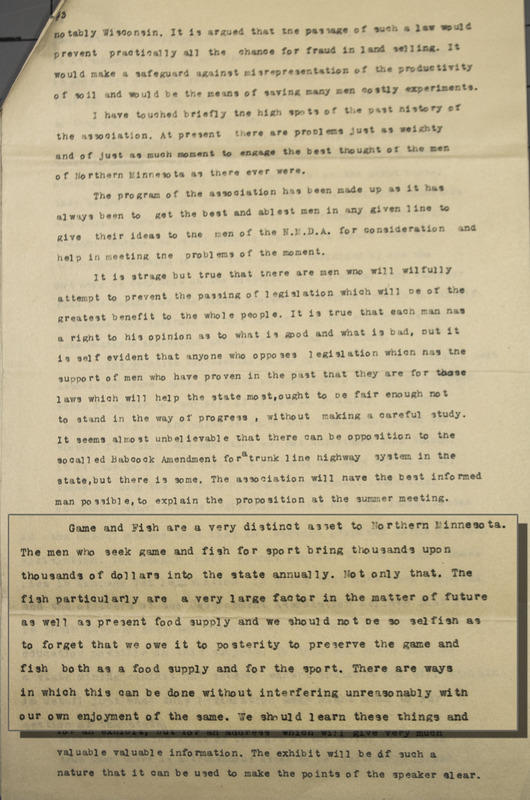 By the early 20th century, Northwoods entrepreneurs increasingly embraced tourism as a reliable business, and in the process transformed the region from landscapes of production, built on extracting the region’s abundant natural resources, into landscapes of consumption, which relied on the beauty and accessibility of the land for recreational purposes. The core of the tourism and resort industry can be examined through the stories and experiences of the Ruttger family, a pioneer in the Northwoods tourism business who still operate today. Joseph Ruttger, father of Alec, Max, Ed, and Bill Ruttger, started his career in the 1890s as a laborer in the logging industry; however, as the timber industry declined, his house soon became a rest stop for travelers, which slowly morphed into a profitable resort. 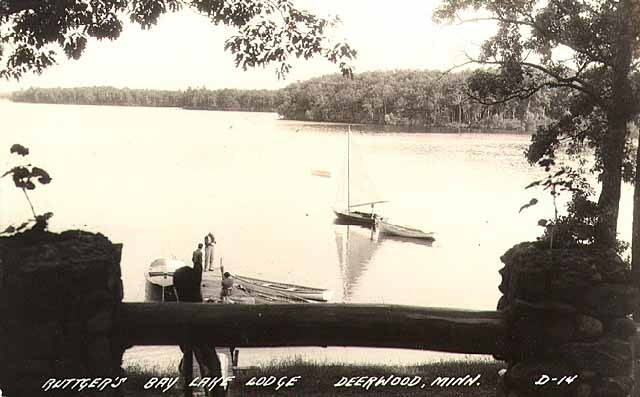 By 1920, Joseph’s son, Alec Ruttger took over management of Bay Lake Lodge and began catering to the growing hunger for a more natural vacation. In order to draw in travelers from both the Twin Cities and other states, the Ruttgers needed both to keep a pristine landscape for fishing and recreation and to produce advertisements that drew in customers from urban communities. In an interview, Jack Ruttger (son of Alec Ruttger) explains that while working in tourism, “you don’t grow crops, but still try to exist and raise your family and you work off the land.” It is known that the Ruttger family, like most resort owners, had a close bond with the land, relying on lakes teeming with fish and lush green woodland encompassing the shoreline to attract and retain customers. Ruttger’s Bay Lake Lodge clearly demonstrates these aesthetic and natural qualities of a successful resort. However, the inhabitation of lakes must always bear some consequence for the ecosystem already in place. Still, between the desire to keep a healthy environment and live comfortably came the decision to draw in customers with romanticized advertisements of the Northwoods environment. Jack Ruttger touched upon this idea in an interview in which he discussed his father’s rhetoric in his 1930s newsletters, one of which reported, “I've just been out walking the woods, and I discovered eight new lakes that nobody ever knew existed.” Clearly, the Ruttger family used an idealized view of the Northwoods in order attract patrons. As opposed to the logging industry, which relies heavily on processes that are overwhelmingly destructive to the environment, the resort industry requires a careful consideration of the internal benefits people receive from being in nature, so the Ruttgers took a cosmetic approach to the landscape by making it an attractive, consumable, and romanticized space. Charlie Kilman, Ben Pletta, and the Minnesota Environments Team, “Bay Lake Lodge: Northwoods Resorts,” Minnesota Environments, accessed April 26, 2019, http://mnenvironments.carleton.edu/items/show/19. On the influence of the Ruttger family, see Aaron Shapiro, "'Follow the Arrows to the Arrowhead': The Environment of Tourism in the Interwar Years," Two Cities, One Hinterland: An Environmental History of the Twin Cities and Greater Minnesota, eds. George Vrtis and Christopher W. Wells (Book manuscript in progress, 2014), 145.